Home Resources Cost Management Want to learn more about Quantity Surveyor services? Want to learn more about Quantity Surveyor services? Download published on January 22nd, 2015 in Cost Management, Delay & Overrun Avoidance, Procurement Advice, Why Quantity Surveyors? Check out our CACQS Best Practices Guide! 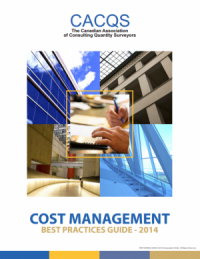 This helpful guide describes the wide range of sophisticated cost control services Quantity Surveyors provide, from establishing realistic budgets to reducing risks.